Excuse me, friend. I couldn’t help but notice you leaving the Fruit Machine, walking away with your Tchea fruit, looking so disappointed. Fifty neopoints doesn’t buy much these days, does it? If you don’t mind, I have a story I’d like to tell you. It might cheer you up—and who knows? You might even learn something. My name’s Maleibu. Bu for short. As you can see, I’m an Usuki girl Usul; that long flowing purple and green hair is a bit of a giveaway. My owner’s name is Emma, and she’s a lovely young woman; she bought me these beautiful princess-like clothes I wear, and looks after my siblings and I very well. When I was younger, though, some years ago, I was a green Usul, and I had a different owner. A young boy, named Luke, who was most interested in battling, which wasn’t my style at all. Luckily, he had another pet for that purpose; a blue Korbat called Bane. Instead, him and I would read together. I’ve always loved reading. We were poor, sure. Most of our neopoints went on buying new Battledome equipment or books. Not much spare for luxuries. The Soup Kitchen was a familiar stop on the way home from the Battledome and the bookstore, and our Neohome was barely furnished at all, with the odd chair or table garnered from the Advent Calendar. But at the same time, Bane and I were quite happy. Luke was kind to us, and paid attention to us, and didn’t care that perhaps we weren’t the most elegantly painted pets. My response would always be a swift “Nonsense!”, followed by a reminder that my brother still had yet to beat the Shadow Usul, or a request for some well-reviewed paperback. He had better things to spend his money on. I still remember the day we first saw the Fruit Machine. We often visited the Lost Desert to see Coltzan’s Shrine—Bane would occasionally feel speedier, or stronger, or tougher, after a visit, though I’m still sure he was imagining things—but we didn’t often make detours. Luke always wanted to get back and spend the afternoon at the Money Tree, waiting for the donations of kind Neopians. This particular day, though, my brother was in a bad mood. “You let me play the Battledome,” Bane pointed out. Luke smiled at me gratefully. Bane instantly cheered up. “I don’t mind. I want to see the new battle supplies they have in. Lost Desert weaponry is awesome.” He scampered off, and Luke and I followed. Sakhmet was pretty cool, I’ll admit. I had a look in the scroll store, and browsed though “Advanced Papyrus Making” and “Sakhmet Petpets”. Even though I could never afford to make papyrus, and a petpet seemed like a pipe dream, they were both interesting reads, and I really liked the way Sakhmet books had hieroglyphic writing underneath the normal words. I tried to work out what some of the symbols meant, but it was hard to work out which symbols matched up to which words. After a while, the Nimmo at the desk was starting to give me barbed “you better buy those” looks, so I put the books down and sidled out the door. Outside, I bumped into a beautiful desert Aisha. “Excuse me,” I said, awkwardly. I rushed off to find Luke and Bane. Free entertainment was always nice, especially since at home the only toy we had was a blue Kacheek plushie, and it was beginning to lose its stitching. When we returned to the Fruit Machine, the Aisha was standing there with an Elephante and a Kau. Luke stepped up to the huge wheel, and clumsily pulled the lever. Pictures of fruit spun quickly, weaving together, and then began to slow. Three Tchea fruits lined up and clicked neatly into place. Tchea fruits, that’s not bad, I thought. Desert fruit’s nicer than the thin Soup Kitchen soup we’d otherwise be having for lunch. The Kau stepped forward reverently, and handed Luke a lumpy brown sack, which clinked as Luke took it. Bane and I stared, speechless. One thousand neopoints? Just like that? I don’t even remember leaving Sakhmet, that day. I know we got home somehow, because later that evening we laughed and talked, discussing how we would spend this amazing windfall. Somehow none of us were very keen to spend it on books or Battledome equipment; our ideas were grander, and revolved around magical items, or gourmet food, or paint brushes. Of course, one thousand neopoints could buy you a lot more in those days. It’s funny, looking back. I was so content, in that little bookshop, flipping through the pages of expensive books I could never afford to buy myself. Knowing my brother and my owner were elsewhere, but close by, and enjoying themselves. I didn’t know it then, but it was the last time for awhile that I would be truly happy. I thought I was happy, of course. Once we started spending that money—who wouldn’t be? I had beautiful new clothes for the first time in years, and we were eating food that wasn’t liquid with the occasional chunk. Having a cupboard stocked with food felt miraculous. But like all miracles, it didn’t last. The money ran out, eventually—I think it was a month before Luke realised the last few coins were jangling around his wallet. So we went back to the Fruit Machine. It became as much a part of our routine as Coltzan’s Shrine. Some days, like you, we got the fifty neopoint and Tchea fruit combo; though since fifty neopoints could still stretch to feed a family for a few days, back then, it was still an occasion to celebrate. Besides, I was always fond of Tchea fruits (and Baggusses, and Ummagines). Most days, though, there was nothing, and I think Luke was ready to give up on the whole thing. Again, I thought I was happy. And I won’t deny it was lovely, seeing Bane so thrilled, and imagining what we could do with all those neopoints. Fifteen thousand! We would live like kings and queens. For a while, we did. I was painted speckled, which I liked, and we moved into a new, bigger Neohome, in Brightvale, with plush carpet and neatly upholstered couches and four-poster beds. We had cups of hot borovan every morning, and turkey dinners, and all the non-soup we could want. 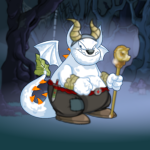 I was even given a petpet; a little Mazzew. I called her Cali. Then one day, I went looking for Luke, to ask if I could visit the toy store. I went into his room, but he wasn’t there, and when I walked around the house calling his name, no one answered. I finally found him sitting down the bottom of the garden, on the lawn, head in hands. Cali meeped quietly in my arms. “Tell me what’s wrong,” I said, softly. “Nothing’s wrong,” he said. “Except that we’re poor again.” He glared at the ground, as if willing it to spit up some neopoints. I looked at Luke: at the anger on his face, at the pain in his voice. Saw how he wasn’t busy at all; he’d never been busy. He didn’t understand that most people worked for their neopoints, or that you had to put a little bit of effort in, and maybe not spend so much straight away, if you wanted to make more. That was the beginning of the decline. Every day, at the first sight of dawn, we were dragged off to the Lost Desert, to Sakhmet, to the Fruit Machine. Every day, Luke furrowed his brow, watching the wheel spin. Every day, the Aisha smiled sympathetically as the three fruits came out unmatching. Luke became more and more miserable, and more and more cranky. The occasional fifty or two-hundred-and-fifty neopoint wins did nothing to cheer him up. The money would be gone in a couple of days, spent on useless ornaments for the house or something slightly nicer for dinner. Bane and I would quietly suggest putting it into a savings account, but he would merely glare at us and accuse us of being ungrateful. Finally, one evening, when my brother and I were sitting around the fireplace, wishing for marshmallows, Luke came in looking grim. “Where have you been?” I asked, anxiously, scared to know the answer. “Luke, no!” Bane said, and began to sob. I felt numb. Luke’s words expanded and filled my brain. Adopted out? “I didn’t want to just abandon you to the pound,” he explained, his voice cracking. “But you have to understand—I can’t afford two pets. And Bane is a Battledome pet, and you’re not. I want to concentrate on training him.” He trailed off. You have to understand; I don’t blame the Fruit Machine for what happened. I have a feeling it would have happened eventually anyway. Luke was young, after all, and although I’m quite sure he loved me, he was never dedicated enough to us to put any effort in. His addiction to the Fruit Machine just accelerated his feelings of being unable to cope. Still, it hurt a bunch then. I don’t think he could have realised just how much. Even though he assured me that the new owner would look after me, I felt like I was being thrown to the Meepits. I had no idea what was going to happen to me, and I knew I was going to miss Luke and Bane very much. As it happened, Emma and her pets lived in Meridell, not far away from us at all. On the day of my departure, I packed up all my worldly possessions into an old suitcase, and Cali hoped on my back, and Luke and Bane walked down the road with me. “Are you going to come the whole way?” I asked. “Of course,” I said. “I understand.” And I did. It can’t be easy, adopting out a pet you care about. I was quite sure—and I’m still quite sure—that Luke did care about me. We arrived at Emma’s house just before lunch. It was a wooden two-storey house, just outside the forest, next to a river. I could see a skunk Usul and a faerie Ixi fishing on the riverbank, and a plushie Grundo was climbing an apple tree next to the house. Though they were too far away to notice me and Bane, they looked happy enough to me, and I relaxed a little. Of course Bane agreed, and we had a lovely lunch with Emma and her pets. I could hardly remember all their names, but she assured me I would get to know them over time; and they certainly all seemed friendly, and very interested in Bane and I. When I told them the story about the Fruit Machine they gasped, cheered, and sighed in all the appropriate places. Emma was true to her word—both about talking to Luke, and that we’d all end up happier. Although Luke still plays the Fruit Machine, and can be quite reckless with his money, I happen to know that he’s doing much better now, and understands the value of having a stable income from the stock market. I see Bane all the time. Actually, I saw him yesterday; we met up at the coffee shop in Neopia Central. He’s working very hard at the moment; of course, you’ll have heard about the goings-on in Faerieland and Brightvale. As a Brightvale Battledomer, Bane is right on the front line against the Spectres. I’m not worried about him; he’s an amazing fighter, and those Spectres better watch out for themselves. And as for me? Well, I’ve got amazing new siblings and a caring new owner, and even though we play the Fruit Machine sometimes, it’s not a big deal, and it’s not our sole reason for living. So don’t be disappointed about your small win—even though it’s not much, it won’t rip your family apart, either, and who knows? Maybe you’ll be more lucky next time. ...Who owns that greedy Kadoatie, anyway? Rots and rots of fun!